Death of a Maid is the 23rd book in the Hamish MacBeth cozy mystery series by M.C. Beaton. When a nosy and annoying meddlesome maid named Mrs. Gillespie becomes the victim of a violent crime in the small town of Lochdubh nestled in the Scotland Highlands, constable Hamish MacBeth sets out to investigate and interview the local townies. Hamish soon learns that Mrs. Gillespie was very skilled in the blackmailing department, and her long list of "victims" is equal to the number of suspects he must interrogate for her murder. In addition to having to handle the murder investigation, Hamish must cope with being around his ex-girlfriend Elspeth Grant; a reporter who has returned to Lochdubh for a short vacation. When she brings along a male co-worker specifically to make Hamish jealous, he begins to question whether he is still harboring feelings for his long-time love Priscilla Halburton-Smythe, or if he is still attracted to Elspeth. 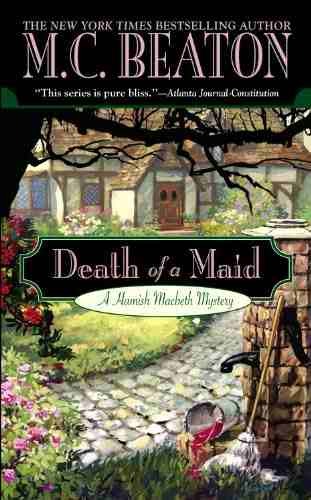 If you're already familiar with the Hamish MacBeth series, Death of a Maid will have you in stitches! The usual comic relief is present, and reading about Hamish meddling with the annoying and cantankerous townspeople is always enjoyable, especially when he makes a point of irritating them. Hamish's ongoing love dilemma is also entertaining - though I am curious to see where Beaton goes with his love-life. Agatha Raisin (the main character from Beaton's other series) also stays forever-single, so maybe the author just likes to keep her main characters unattainable so they are more appealing to readers. My favorite sub-plot in Death of a Maid is when Detective Chief Inspector Blair - Hamish's colleague and rival - convinces a television crew to feature Hamish in an upcoming documentary about successful detectives, with high hopes that Hamish will finally be transferred to a station outside Lochdubh. The plan backfires of course, when Hamish turns the tables and convinces the television crew that Blair is the superior detective. Too funny. Following Death of a Maid in the Hamish MacBeth series is Death of a Gentle Lady (2008), Death of a Witch (2009), Death of a Valentine (2009), and Death of a Chimney Sweep (2011). What are your favorite Hamish MacBeth books? What do you think about M.C. Beaton's Agatha Raisin series?